Dr. Michael H. Gold, a previously featured physician in our Physician Spotlight, has been featured in the Fall 2017 issue of National Black Nurses Association News. Read the article here. Treating keloids is very frustrating, not only for the patient suffering from them, but also for the health care provider. A recurrence is fairly common in most therapies. There are many different options for treating keloids and many suggest that they have the magic formula for making keloids disappear. I have been involved in scar and keloid research for almost 30 years and have found that many of the so-called wonder cures for keloids are just here one day and gone the next. What I want to share with you may be the best thing that has happened to keloid therapy in a very long time. Most dermatologists know that using intralesional (IL) steroids is one of the mainstays of keloid management. Steroids help shrink the lesions over time. We also know that IL steroids can be painful and if not done correctly. It can induce skin atrophy, broken blood vessels, and leave the skin looking abnormal. We also know that the use of topical silicones gels and sheets work well for hypertrophic, or raised scars, but most of the time they do little on their own. This means we need other therapies to make keloids better. We need to reduce the risk of recurrence, which in many cases mean bigger and more painful lesions. Surgery has been used for years. The recurrence rate for surgery alone is high. It lowers when IL steroids are done after the procedure, but that recurrence number is still not acceptable. Radiation therapy has also been used and alone, the recurrence rates still remains too high for one to use this modality alone. So what can we do? Sensus, the leaders in Superficial Radiation Therapy, also known as SRT, recently developed the Sensus SRT 100. A superficial radiation device that has been approved by the US FDA for the treatment of keloids. 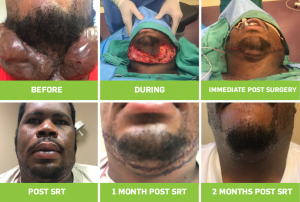 Clinical studies have shown that if you perform a surgical procedure, to remove the keloid then use the Sensus SRT for three consecutive days after the surgical procedure (fractionating the radiation dose over three days), we can take the recurrence rate from the 60-70% range down to under 10%. It can possibly be even closer to less than 1-2% at one year, which is truly remarkable. Our office treats lots of keloids and we are so excited to be able to offer to our patients the Sensus SRT procedure for the treatment of keloids. It has changed my mindset, for these were always the patients I knew I had nothing for therapy wise. Now when I see a patient with a keloid –especially those that are large and itchy and painful. I know I can work with my plastic surgical colleagues to remove the keloid and then perform SRT on three consecutive days. I know the patient is going to have a great result with a minimal chance of the keloid recurring. The Sensus SRT has changed my approach to treating keloids. The patient in the picture is an example of someone that has horrific keloids and in the past. I had no clue what would work to make them go away. IL steroids would not work and surgery or radiation alone would mean a high chance of recurrence and more concerns, so this patient was stuck. We used surgery and three fractional SRT treatments, almost 6 months after the procedure he still remains keloid free. I suspect he will not have a recurrence at this point out, in fact, he is so excited that he plans on having even more of his keloids removed in the near future. The Sensus SRT is a game changer for us and should become standard therapy for all keloids at this time. Dr. Michael H. Gold is a board-certified dermatologist, cosmetic surgeon and the founder of Gold Skin Care Center, Advanced Aesthetics Medical Spa, The Laser & Rejuvenation Center, and Tennessee Clinical Research Center located in Nashville, Tennessee.